Christmas literally is my FAVOURITE time of the year. I am one of these annoying people that is ridiculously organised and has all their presents bought and wrapped before December even arrives just so that I can really enjoy the festive period without any of the stress of spending money I'm not sure I've got. And of course part of that enjoyment comes from watching all of my best loved Christmas films and near the top of my list happens to be Elf the Movie. Can you believe that film is now fifteen years old? That's older than my eldest daughter, yet it still feels like yesterday when I was sitting down for the first time ready to be injected with some festive cheer. And you know the sign of a good movie when all these years later I'm still watching it with the same excitement, sharing that joy with my children. The only difference is now I can quote most of the lines as we view it. 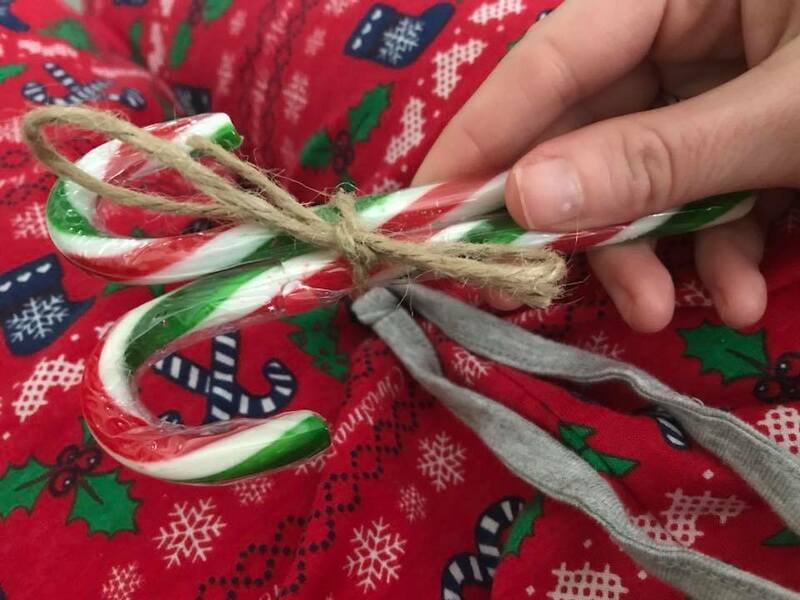 "I passed through the seven levels of the Candy Cane forest, through the sea of swirly-twirly gum drops, and then I walked through the Lincoln Tunnel." If you haven't seen it yet then quite frankly you must be a Cotton Headed Ninny-Muggins and you must rectify your mistakes ASAP. Now to celebrate such an amazing milestone New Look have released a fantastic pair of Elf PJs within their Christmas range and they very kindly sent me a set along with some other wonderfully Christmassy gifts including the DVD itself so I could sit in my nightwear whilst watching it. "I planned out our whole day: First, we'll make snow angels for two hours, and then we'll go ice skating, and then we'll eat a whole roll of Toll-House cookie dough as fast as we can, and then to finish, we'll snuggle." 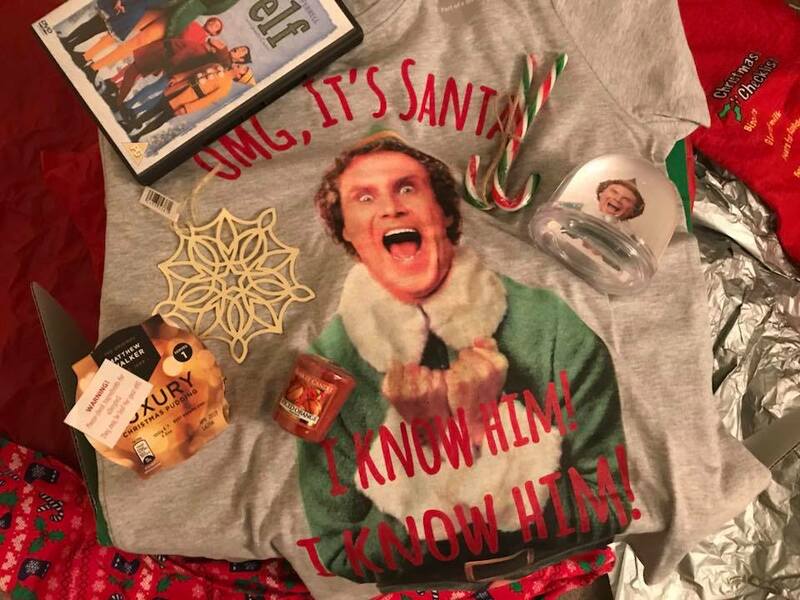 Complete with t-shirt and jogger style bottoms, these pyjamas come complete with one of the most famous quotes from the film: 'OMG, It's Santa. I know him! I know him!' With an elasticated waist and tie at the front of the trousers, they are oh so comfy and adaptable for all sizes. I have size small which as well as fitting me also happens to fit my thirteen year old daughter, not that I'm planning on letting her borrow them. . .
Of course to watch a Christmas film the proper way, you need to sit with the fire on, Christmas candles burning, whilst being snuggled in a big blanket, wearing the necessary festive PJs and snacking on plenty of festive treats. 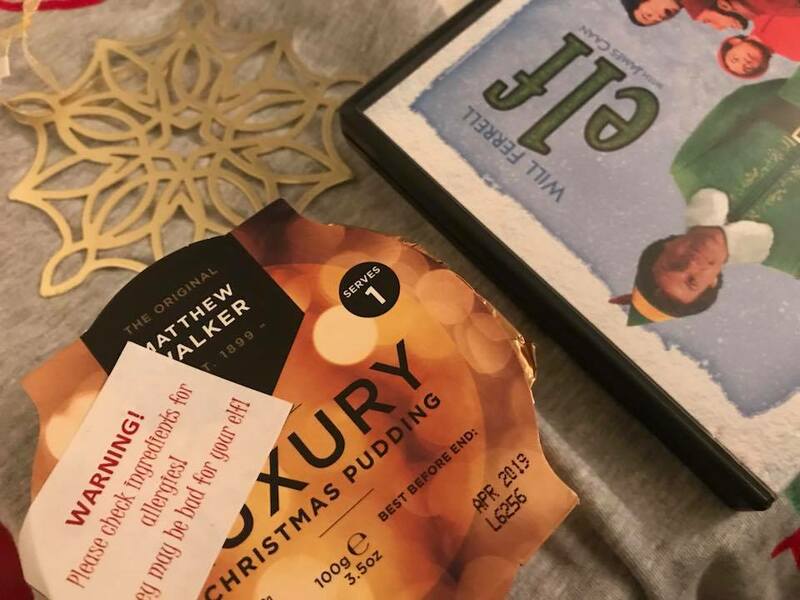 I have to admit that the Christmas pudding that came with my package got eaten before I had a chance to watch the film but the candy canes were a perfect accompaniment. I now challenge you to watch Elf without a smile appearing on your face! With plenty of memorable quotes, an abundance of feel good moments, a smidge of romance and of course our favourite best known Elf, it's easy to understand why a lot of people actually class the movie as the best holiday movie of all time. I'm not sure it's the best but it is definitely a modern time classic, they don't make many like this anymore! "You did it! Congratulations! World's best cup of coffee! Great job, everybody! It's great to be here."